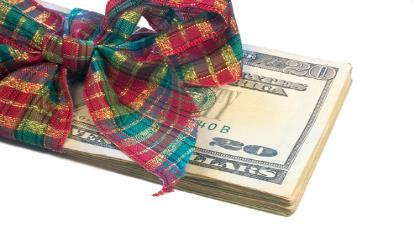 Your holiday budget may be larger than you think if you put a little creative effort into it. Work out trades with other business owners for gifts, sell forgotten clothing, offer discounts on your own business to rack up the income, make your own gifts and decor, and start saving for next year! When you run your own business, there's usually not a whole lot of wiggle room in the budget. So when the holidays roll around, it can be a challenge to find the funds for gifts, food and decorations. But you've worked hard to create your own business—and you can use some of that same creativity to supplement your own holiday budget. Here are five ways to do just that. Own a photography business? Offer pictures with Santa. Sell handmade items? Promote your products as holiday gifts. Get the creative juices flowing and brainstorm ways that your business can help other people during the holidays—and in return you'll have a little more income to work with. There's just something about a handmade gift—they're one-of-a-kind and something they certainly won't get two of. But, handmade gifts can also cost less without looking like they cost less. Browse your local craft store or Pinterest for ideas. Take it one step further and cut your decorating budget by creating your own. You could even get the kids involved and make it a fun indoor activity. Growing up, my mom always cleared out the toys we didn't play with anymore just before Christmas to make room for the new ones. Check out local thrift shops that may pay for your things, like Once Upon A Child for kids items or Plato's Closet for teen clothing, and you may be able to both do some cleaning and earn some extra holiday cash. If you have a good network of other WAHMs near you, see if any of them are interested in trading services or products that may interest those on your shopping list. When the budget is strict, it's a good idea to set aside some money for the holidays year-round. Put a small amount every week in a holiday savings account. Think you can't spare it? At the end of every day, empty the spare change and single dollar bills out of your wallet. It adds up. You can also save rebates and credit card rewards for end of the year expenses. Holidays should be enjoyable and family focused—don't let financial stress ruin this time of year for you. Put some of that same creativity you use in your business into some holiday planning, and you'll be surprised at how far your budget can go.